Classic and comfortable. All you need for everyday wear right here. 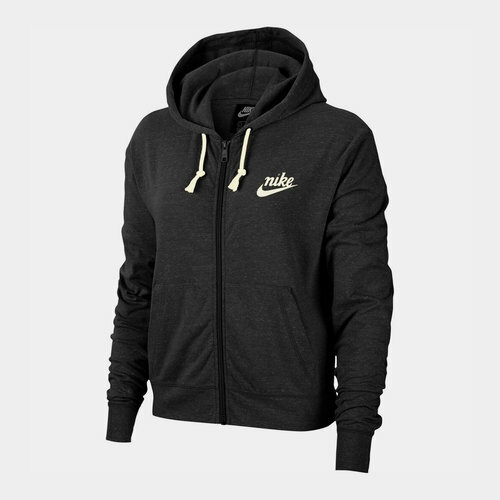 Pull on the Nike Gym Vintage Ladies Hoodie in Black. Keep it old school without compromising your chills with this comfortable Nike Sportswear hoody. This top comes crafted from a super soft, lightweight jersey fabric and comes with an oversized hood. the hood has a thick drawcord for a vintage-inspired look allowing you to create your own fit. This jacket has 2 side kangaroo pocket to allow for items to be stored away safely. Buy the matching Nike Sportswear Gym Vintage Ladies Sweatpants for a trendy, tracksuit look.